That quote is taken from the dedication page of Lewis’ Lion, Witch and the Wardrobe. I think it sums up something any dedicated father quite frankly doesn’t want to hear: The pavement of childhood: it ends. Fortunately, Clive Staples didn’t leave us hopeless as he closed the inscription. because quite frankly, I’m not equipped to accept any other possibilities. Something about the way he so confidently expresses it, though, haunts me when I read it nonetheless. Because I’ve always been a man haunted by the inevitable. I can see the train coming. Both my little girls are crafty, creative little geniuses. Both have ridiculous facility with sewing machines, glue guns, and some ridiculous affinity for cutting pieces of paper into nearly irretrievable floor confetti. They literally make a portion of their own clothing. That’s how good they are. Their craftiness, when they were younger, made wanting to sit at my fly vice a fait accompli–it was another craft. Project. Expedition. A colorful aside that again requires sufficient vacuuming at its conclusion. And though both have been down the road of infatuation, it is my younger daughter, Clara, who likes it enough that she received her own vice and kit on her birthday last year. Clara also has a standard, H2O Fly Shop rod that she won on opening day from the local shop. It was our trip to McCloud that I promised her we would “break it in.” And while the general idea of fly-fishing is an all-consuming love during this season, it was precisely this moment–this little promissory excursion–that governed my streamside thoughts as I routed the McCloud River; This trip is not about some ridiculous trek into solitude. It’s about relationships. “Cool dad, ” she’d say while proving shoes are gratuitous and caucasian feet can be black nonetheless. Wednesday came around, and as I corralled her for dinner, I reminded her of time frames and plans. “I know, dad,” was the refrain. “Sure you still want to do it?” I asked. “Uh, YE-esss,” she reassured me with that “Hello, McFLY!” kind of diplomacy. I smiled. Both inside and out. She really needn’t have finished that phrase, because I actually cannot confirm I heard it. because another phrase dominated my emotional no-fly zone. My God, I really am losing her. Daddy’s little girl is starting to shove off. The little girl who once wept because she knew we’d not always be “snuggle-bugs” is perhaps beyond the emotional horizon once and for all. She did wind up going with me, after I expressed to her it was about time with her, and not about whether she caught any fish. I had taught her the “closed loop, 10 and two” sequence that all fly-fishing beginners learn. And now was her chance to do it in real-time, not acting in front of some situational green screen with a phony fly on the end of it. As it turns out, it really was about “the journey.” Taking the lengthy switchbacks down to Middle Falls, Clara has the ability to locate every territorial creature known to man, spot, chase and sometime capture them. I heard more insight as to her running chipmunk count, lizard run ups, bug lore, and bear-sighting probabilities on the way down to MY focus than anything she might have had to say about those elusive trout in the water. In an hour’s time, she sustained nine or ten strikes on dry flies. And yes, it jazzed her. She finally managed to insinuate one on to the hook, ask me “what do I do now?” as the fish managed to dis-insunuate himself a moment later. Never have I enjoyed the intermittent need to unhook a wayward backcast from the trees as I did this evening. “Sure,” I smiled. I knew she was excited to see fish after fish grabbing for her fly. That was good enough for me. As soon as she realized the Switchback trail was before us again, any and all complaints of erstwhile tendonitis and photophobic nausea vanished. It’s time to start looking for animals again. Before we left the vantage point of the startlingly beautiful Middle Falls, she noticed our rods leaning against the tree and said, “you should take a picture of those like that.” I obliged. back to locating pregnant reptiles. It was at that moment that I realized it. We both had a blast. We just had a blast with contrasting peaks. I could repeat the entire trip devoid of any fishing, and her little heart would be full of intrigue, mystery and adventure. It just so happened she got to make the water splash with some degree of control as an added deal-sweetener. “Mom, I got nine strikes, and hooked one!” heard her exclaim as she entered the cabin. I smiled. She then ran down the chipmunk census, and talked about an expended stonefly shell I had brought back with me off a rock “for study.” Of course, I didn’t see it. She did. I offered to take her out the following evening, solely contingent on her request. It was never made. I figured that would be the case, as the cumbersome backpack of the “need to wear shoes” alone would perhaps be a buzzkill for someone as free-spirited as Clara. And I was okay with that, because I don’t believe in trying to manufacture a moment anyway. Of course I’m going fish that thing. Are you kidding me? Then, without any pretense, predication, lead up or cajoling, I hear those magic words–those words that perhaps mean something entirely different to each of us in terms of terrestrial focus, but we both know mean something eternal at their core. It may not last forever. But she was given to me for things I believe will. This post–a repost from a now-dormant blog of mine–2012. This entry was posted in Books, CS Lewis, Fly Tying, Tenkara, Uncategorized and tagged Blogging Advice, C.S. Lewis, fatherhood, fly fishing, McCloud River, parenting, publicity, relationships, Self publishing, Tenkara. Bookmark the permalink. Loved this! I hope to hear those words from my daughter someday. 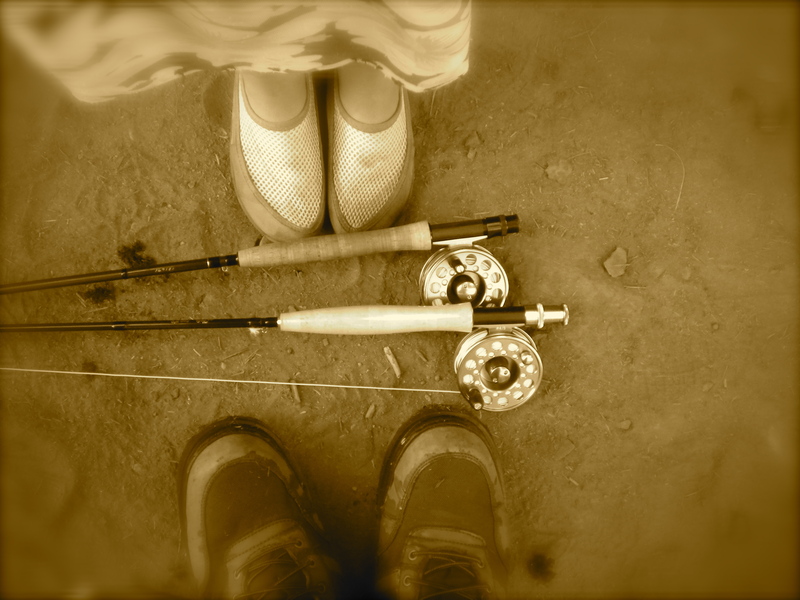 You should check out my blog as I try to tackle and balance parenting with a fishing addiction of sorts as well. Cheers to being a great dad and hearing those lovely words. Well written. I wasn’t trying to plug my blog haha- I just connected with the parenting and fishing topic! 😉 Thanks!! Naw. That’s okay. I’m 28 posts in–and I certainly plan on being a big player. And you’re welcome. take time and see this blog–fishing is a part, but I’m just flat out all over the board. Ron, we loved this post back in 2012, and we think it should be printed and bound into a little pocket-sized volume.. It’s that good, trust us. Oh, and then, well . . . . . ta-da! THIS would be your first book. Period. So the one you’re starting now won’t give you the “stage fright” syndrome. Face it. You’ve been writing “your first one” all along, since who knows when?!? You just haven’t submitted them. Go for it, don’t worry about a thing, and write, write, write! Enjoy the journey. it’s a gift from your Maker. My favorite part of Lewis’ quote is, “But some day you will be old enough to start reading fairy tales again.” That is absolutely magical. As is this story. And this line from your post, “It may not last forever. But she was given to me for things I believe will.” Trust me – from someone who grew up without a father, let me assure you that you are giving her the GREATEST gift she will ever receive. Thank you, thank you, thank you, for giving it to her.